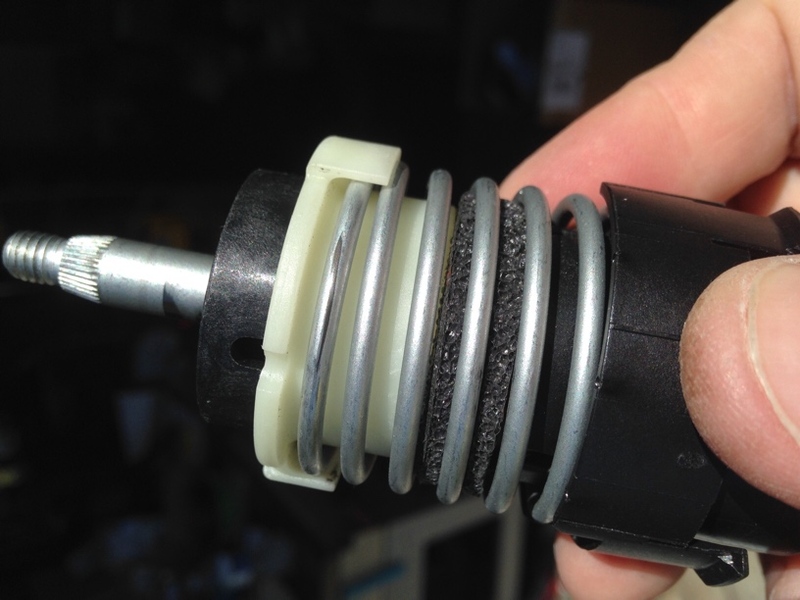 I completed a successful project on my 2001 Boxster haven't seen documented that I wanted to share: how to remove, clean, and lubricate the e-gas potentiometer. This may also be called a throttle position sensor. 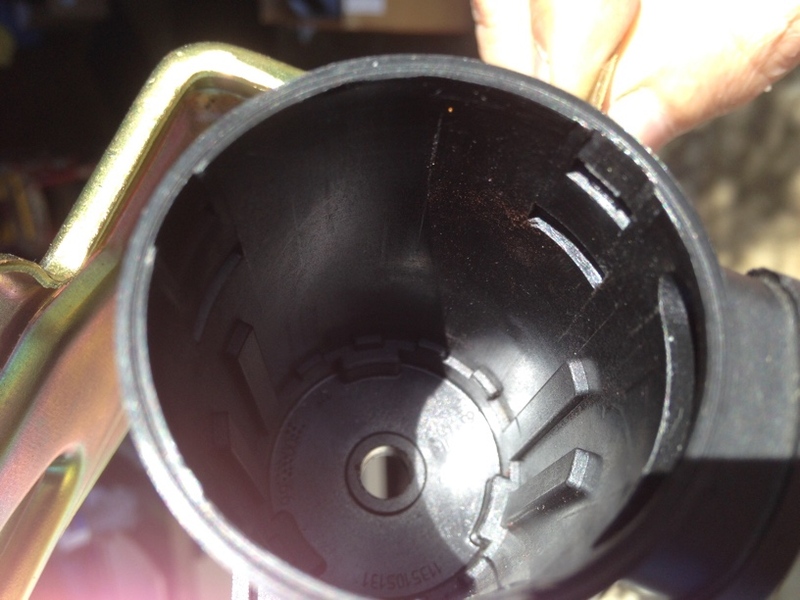 It has a fairly stiff spring in it that internally rub against its housing and this is what causes the "stiction." The symptom of the service being needed is the accelerator pedal has 'stiction", or a "notchy" feel where it will not move as smoothly as expected. This may be worse at some times than others (in my case, it seemed temperature can have an effect). It can impede driving enjoyment and make smoothly launching the car using the clutch difficult, and is especially noticeable when crusing and making minor accelerator pedal adjustments (because you'll find the pedal won't quite adjust as you'd like). However, after tearing into the gas pedal, if you find there is stiction coming from the potentiometer above, this DIY is for you. The accelerator pedal connection to the e-gas potentiometer by a short length of cabling. 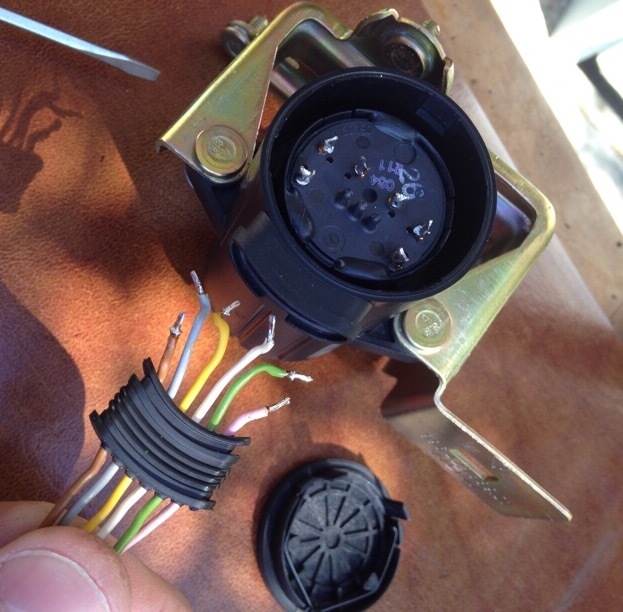 If you pull on the cable end to actuate the e-gas potentiometer, and notice it making noise or not moving smoothly, service on the potentiometer is warranted. The potentiometer is mounted to the brake pedal bracket by 3 10mm nuts and studs. Accessing them is bit of a contortionist exercise. The less limber mechanics may find it helpful to remove the drivers seat. (Otherwise, at least moving the seat all the way back.) Remove the heater duct going to the driver's side dash vent, and then you can access the three nuts from below, and reaching around from above if necessary. Use an open end and/or box-end 10mm wrench to get to these nuts. You'll want to have the accelerator pedal assembly either removed from the car, or connected to the cabling and "dangling loose". 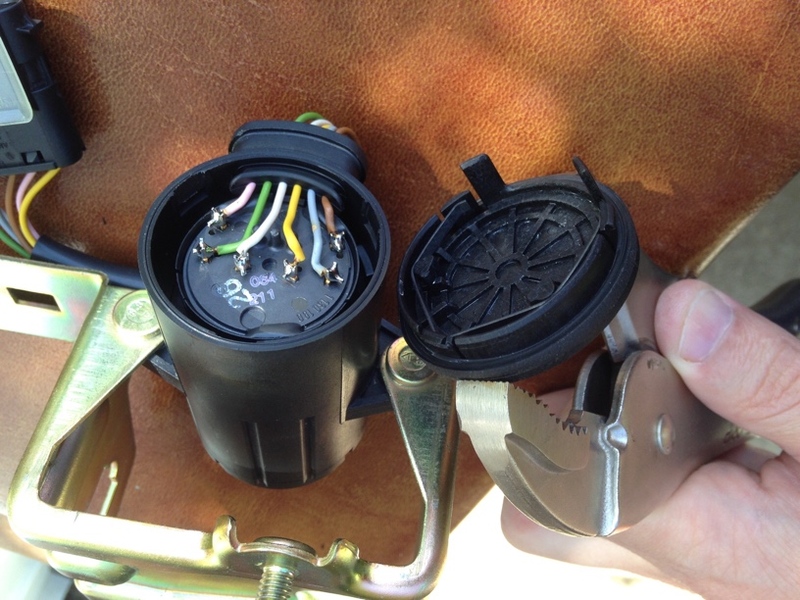 It is not necessary to remove the cabling from the e-gas potentiometer before removing it from the car. 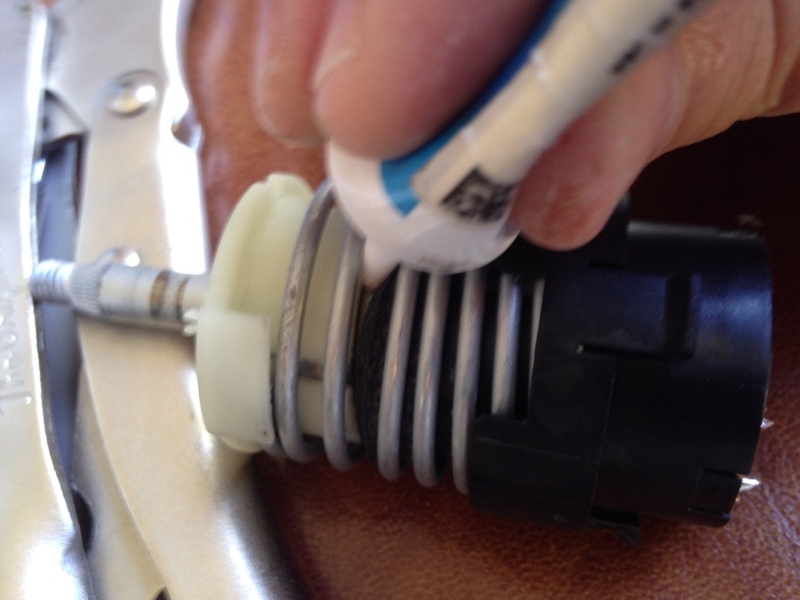 It's not necessary to completely remove the 10mm nuts to remove the e-gas potentiometer. You can just loosen the nuts, and the e-gas potentiometer will slide out toward the back of the car, and can be removed from the car. 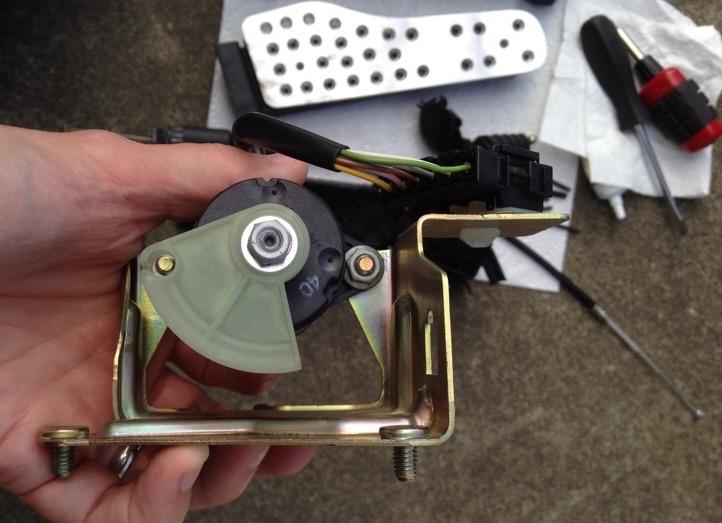 (The photo shows the e-gas potentiometer, on mounting bracket, at lower right), and split apart accelerator pedal assembly and connecting cabling at left. Last edited by jakeru; 04-08-2016 at 08:14 AM. Here is another view of the e-gas accelerometer. 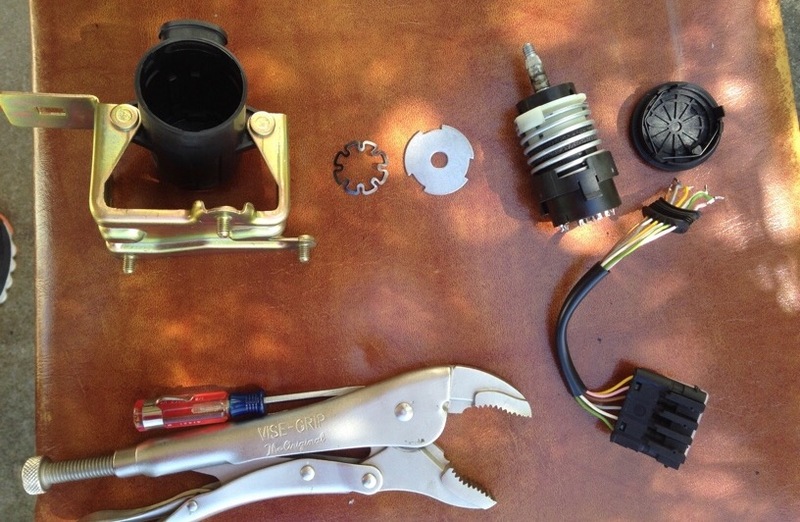 Mark the position of the throttle bellcrank to the potentiometer shaft and housing/bracket, (using something like a sharpie) since it will have to come off and you'll want to reassemble it with the original index. It comes off with a 10mm nut. Then you'll need to desolder the 6 wires underneath the cover, and remove the e-gas potentiometer wiring harness from the housing. It just pulls out. Now, clean all the dirty surfaces that rub against other surfaces, and lubricate them. 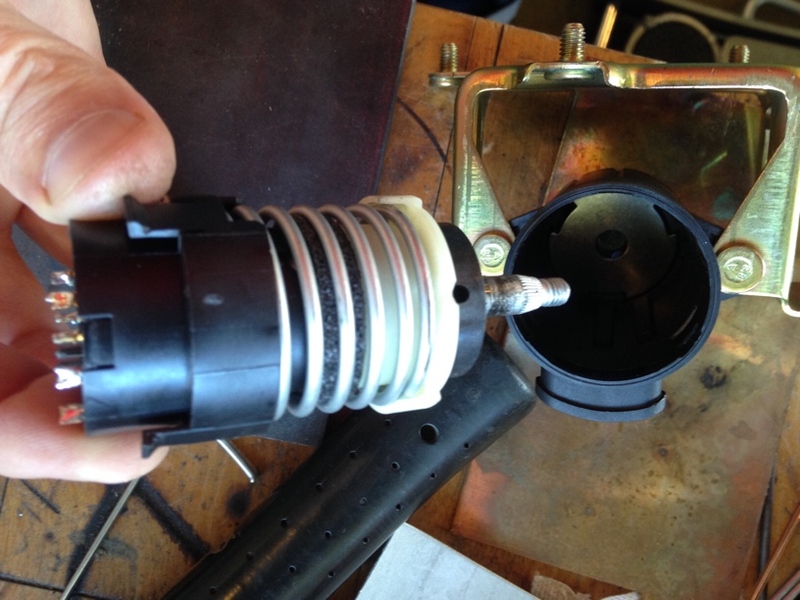 The shiny, worn area on the outer spring was also making contact and needed lubrication. A rib in the housing this spring was rubbing against was also noticeably worn (worn spot visible in attached picture). I decided to lightly lubricate the whole outside and inside surfaces and ends of the spring, some accessible areas of the inside spring as well, as well as the whole length of the ribs inside the housing, before reassembling. Reassembling was a bit tricky as the spring needed some pretension (about 1/4 turn or so) to be properly installed. There is probably some special tool the factory used. I got it done by holding the housing in a bench vice and using a thin flathead screwdriver to help with the rotational tensioning. 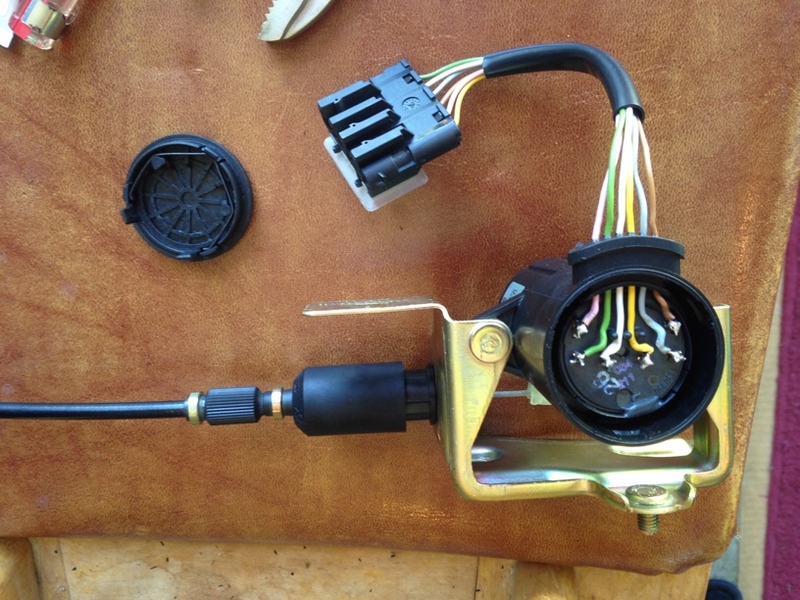 Obviously to complete the job, re-solder the wires, replace the cap, and reinstall the assembly in the car and reinstall the gas pedal assembly in the car also. You can also clean and lubricate the cable if desired. 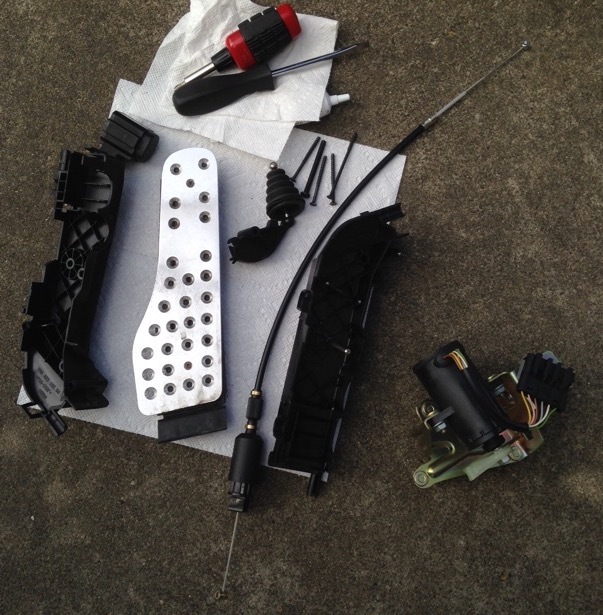 I recommend cleaning and lubricating the pedal assembly at this point if you haven't done so already, since it's relatively easy and could help. Enjoy a perfectly smooth accelerator pedal! Marvel at how much easier the car is to launch from a stop, and how much more of a joy it is to drive! This is great! My car has the throttle stiction issue that you described, so I'll be taking on this project now. Thanks for the excellent pictures and the tutorial. Great write-up, thanks! This will be very useful for anyone who has that issue of Sticktion in the pedal. I have a separate question for you or anyone who has this assy opened and readily accessible.